If you had told the 12-year-old version of me that some day I’d be talking education, housing, and football on local TV, I would have had to accept flying pigs were going to be involved, too. As of a couple weeks ago, apparently Ms. Piggy has wings. The College Football Playoff National Championship will be held at Levi's® Stadium in January 2019. In anticipation, our team has launched an exciting partnership with the College Football Playoff Foundation and the Bay Area Host Committee, who have set out to raise awareness about the impact high housing costs have on our educators and to offer direct support to educators facing homeownership challenges. The cornerstone of this partnership is the Down Payment Giveaway for Educators, in which the CFP Foundation and the Bay Area Host Committee are making a $150,000 contribution to help public school employees cover home purchase costs. 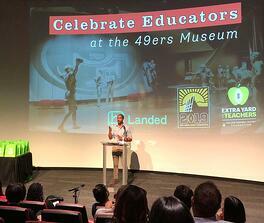 This contribution is part of a year-long campaign by the BAHC and the CFP Foundation’s Extra Yard for Teachers program, which will ultimately provide $1 million in direct support to Bay Area educators. Partnerships like this prove there’s a collective will here in the Bay Area not only to discuss the housing challenges that have reached a crisis point for too many people – including our educators – but to address this problem through innovation and shared action. Three Bay Area educators will each receive $25,000 to help them own homes in eligible San Francisco Bay Area counties, where median home prices rank among the highest in the country. A series of prizes to support financial wellness will be awarded to eligible educators who enter the giveaway but do not win the top prize. Thanks to the support of our partners, Landed is also hosting free community resource events in Oakland (Oct. 23), Santa Clara (Nov. 8), and San Francisco (Dec. 4), where real estate agents, mortgage lenders, credit repair agencies, and financial advising services will share their expertise and answer individual questions free of charge. and drastically increased housing supply for our educators, we hope Landed and this partnership become a helpful tool in the collective toolbox we need to turn our housing reality around. At Landed, we believe it’s the job of us all to “uphold those who uphold us.” This partnership announcement is just one example of this, and I can’t wait to see what else we can accomplish together. Interested public school employees can find out more and check their eligibility by visiting the Down Payment Giveaway for Educators homepage: landed.com/extrayard. 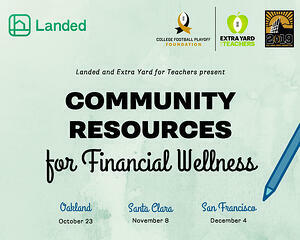 You are also invited to RSVP to our Community Resources for Financial Wellness events. Alex Lofton is Co-Founder of Landed. Origin: the Pacific Northwest. Proud product of Bellevue Public Schools. Decompression methods: time outdoors, playing the ‘funcle’ (fun-uncle) role, and the dance floor.